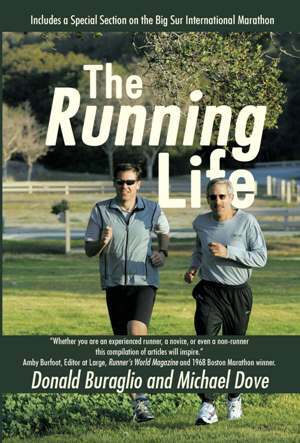 Both Mike and Donald are lifelong runners, and authors of a twice monthly column on all things running-related for the Monterey County Herald. Local readers can find their articles in the sports section every other Thursday. Donald Buraglio is a physical therapist with more than 20 years of experience in endurance sports. He studied exercise physiology at UCLA, where he was a member of the varsity rowing team, and attended graduate school at the University of North Carolina. Donald began his distance running habit while in college, and ran his first marathon at age 22. He has gone on to compete in a variety of events ranging from 1-mile track races, hundreds of road races, dozens of marathons, as well as ironman distance triathlons, ultramarathons, and 100-mile trail runs. He has competed in some of the most famous endurance events in the world, including the Boston Marathon, Pikes Peak Marathon, Wildflower Triathlon, Dipsea Race, and the Western States Endurance Run. Donald has lived in the Monterey area for 20 years, and in addition to writing for the Monterey Herald, he is the author of the world-famous website Running and Rambling, one of the top-ranked endurance sports blogs on the Internet. His website has won best blog, best endurance blog, and best health blog awards from reader polls of triathletes and runners. Donald is also a barefoot running aficionado, and dreams of doing an ultramarathon with naked feet someday. When not working, running or writing, Donald enjoys spending as much time as possible with his wife and three children in Carmel Valley, California. Michael Dove is retired after a 32-year career in information systems management. He has 25 years of experience in all aspects of distance running; as a competitor, race organizer, coach, speaker, and writer. He has a BA in Economics and MBA in Finance from the University of California at Berkeley and played intercollegiate golf. He is on the Board of Directors of the Big Sur Marathon as well as other races in the Monterey Bay area. He developed the nationally recognized and award-winning Just Run youth program and the Take 5 to Run program. He has been on the executive board of the Big Sur Distance Project and the Steps to a Healthier Monterey County project. He is also President of the local USATF running club, the Monterey Bay Wednesday Night Laundry Runners. Michael has coached hundreds of runners in marathon and half marathon training sessions and is the author of the Big Sur Marathon training manual. In 2008 he received a National Jefferson Award for Public Service for his running related volunteer activities. As a runner, Mike competes in track and field, cross country, and road races. He has been one of the best Masters and Senior runners in the United States for the past 20 years, and has won USATF National Championships on the track and on the roads. He ran a 15:36 5K at age 49 to equal the U.S. National record. He also ran a 32:20 10K at age 52, and holds age group records in several marathons including the Big Sur Marathon. He currently lives in Corral de Tierra with his wife, and has three grown children and 4 grandchildren. He dreams of emulating Ed Whitlock, currently the only 70-year-old who has broken three hours in the marathon.